Saturn's moon Dione hangs in front of Saturn's rings in this view taken by NASA's Cassini spacecraft during the inbound leg of its last close flyby of the icy moon. The image was acquired on Aug. 17, 2015. The Cassini spacecraft recently got its last close views of Dione, a small icy moon orbiting Saturn, and the results are astounding. Images returned from the Aug. 17 flyby show a mottled surface of craters and ice. One image shows Dione in front of the rings of Saturn, emerging from shadow. The closest approach brought the spacecraft to within 295 miles (474 kilometers) of the moon's surface.You can see more of Cassini's amazing Dione photos in our full gallery. "I am moved, as I know everyone else is, looking at these exquisite images of Dione's surface and crescent, and knowing that they are the last we will see of this far-off world for a very long time to come," Carolyn Porco, Cassini imaging team lead at the Space Science Institute in Colorado, said in a statement from NASA's Jet Propulsion Laboratory. Cassini has had four other close encounters with Dione since arriving at the Saturn system in 2004. Its closest approach was in December 2011, when it came within 60 miles (100 kilometers) of the satellite's surface. Dione hangs in front of Saturn and its icy rings in this view, captured during Cassini's final close flyby of the icy moon. North on Dione is up. The image was obtained in visible light with the Cassini spacecraft wide-angle camera on Aug. 17, 2015. During this last close encounter, the spacecraft only took a few images of Dione because the main goal of the flyby was to measure the moon's gravity, which will help scientists learn about its internal structure. This made imaging tricky because it wasn't Cassini's camera that was controlling where the spacecraft was "looking." Instead, Cassini was mostly studying Dione with its gravity science experiment, as well as instruments to measure the moon's magnetosphere (magnetic environment) and plasma (superheated gas), to help scientists understand processes on the moon's surface. 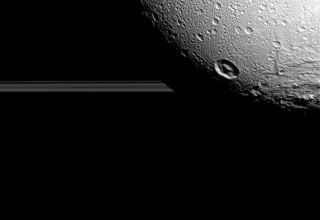 Cassini's last close encounter with Dione is one in a series of flybys scheduled for 2014. The spacecraft will make three final flybys of Enceladus — a geyser-spouting moon — on Oct. 14, 28 and Dec. 19. During the Oct. 28 flyby, the spacecraft will move through one of the plumes at a distance of as little as 30 miles (49 kilometers) from the surface. Next year, Cassini's flyby schedule includes distant looks at the tiny Saturn moons of Daphnis, Telesto, Epimetheus and Aegaeon as well as a few icy moons. In the last year before the mission conclusion in late 2017, Cassini will move through the space between Saturn and its rings.